For every action there is an opposite and equal reaction. When a cold snap covers the Southeast everyone has to harvest their citrus at one time, or lose it all to Old Man Winter. 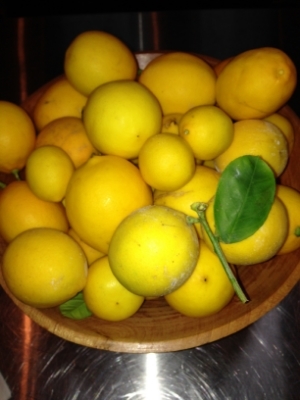 In a balmier winter, we like to pluck our citrus leisurely and leave fruit on the trees to gaze upon. No such luck this year. WhenGod gives the Deans lemons, of course we made lemonade, but we didn't stop there. We also created lemon-infused cocktails, chicken thighs with caramelized lemons, handmade lemon bow tie pasta, lemon confit, lemon mousse, lemon fennel ginger tea and we still have gleaming yellow orbs to play with. This is only a fraction of the bounty of one Dean's single tree. Tons more where these came from!!! can you see the lemony flecks? These bow ties are ready for their night out. Pair with a simple tomato sauce - canned whole tomatoes, chopped garlic and olive oil. Simmer for 15 minutes and then puree. The acid from the tomato sauce is a perfect blend with the tang of the lemon pasta. You'll never be caught underdressed with these bow ties. The Deans are akin to colanders today because that cold weather that has gripped the Southeast has got our teeth chattering so, we keep boiling water and making more tea. We are the best hydrated Deans of any academic institution anywhere. Quite an accolade! Fresh fennel fronds, a large knob of ginger peeled and sliced, and the ubiquitous Meyer lemon that started it all, sliced. Cover with boiling water and let step for five minutes, then strain into mug.